Do you remember your first bike ride? Or the first date – and kiss? People often fear doing something new. It’s normal. We are status quo creatures. We are afraid of changes. They are risky. Particularly in monetary policy. Indeed, we like technical innovations, but we prefer predictable and conservative banks, don’t we? The personal changes in the top positions at central banks are especially hazardous. Indeed, do you remember what Draghi did during his first meeting as the President of the ECB? He cut interest rates, reversing Trichet’s monetary tightening. And do you remember the first decision of Kuroda as the Governor of the BoJ? He announced aggressive asset purchases under Qualitative and Quantitative Easing. So it’s understandable that the financial markets are a bit nervous ahead of the FOMC meeting. Will Powell hike? What will he say? Will he reveal a hawkish bias? These are the questions investors are asking right now. Let’s try to answer to them. The Fed will hike. It’s almost certain. The market odds of such move are more than 94 percent. It implies that the lack of a hike would be significantly more disruptive than a hike at this state of market expectations. Powell will not risk upsetting the markets. As the move is practically fully priced in, gold prices shouldn’t fall on that. Actually, they may increase afterwards, as investors often sell the rumor and buy the fact. What really matters are the new Fed forecasts and Powell’s forward guidance. Will he signal that four rate hikes are likely this year? Three of four hikes in 2018? The market consensus is that the Fed will hike the federal funds rate three times this year. However, Powell expressed a lot of confidence in his recent testimony before Congress. As a reminder, he said that some previous headwinds became tailwinds. Hence, investors worry that Powell could accelerate the pace of Fed’s tightening cycle, showing a hawkish bias, despite the fact that some of the recent data was disappointing (think about subdued consumer inflation in February). Some analysts even claim that the shift from Yellen to Powell caused the recent stock market turmoil. Indeed, the recent strengthening of labor market conditions combined with fiscal stimulus and the more hawkish composition of the FOMC has raised the chances that the dot plot will show a quicker pace of policy tightening preferred at least by some members of the Committee. But the Fed doesn’t need to decisively signal the fourth hike now. We don’t say that there will be only three hikes – what we are saying is that it would be reasonable for Fed to wait for more data, given the fact that the fourth hike would not come until the end of 2018. So why should the Fed risk its – not very high, by the way – credibility? If history is any guide and the pattern established since December 2015 will hold, the price of gold should remain under pressure until the release of the FOMC statement and perhaps the immediate aftermath. However, after a while, the attention should return to political uncertainty about Washington trade protectionism and fiscal policy. It should allow gold prices to climb higher. 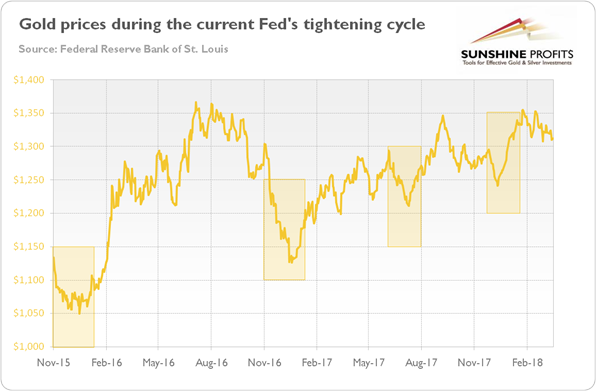 Indeed, as the chart below shows, the price of gold fell ahead of the FOMC meeting and rallied soon after (the yellow rectangles mark the relevant periods) during the current Fed tightening cycle. Chart 1: Gold prices (London P.M. Fix, in $) since November 2015. Surely, there is a risk that the Fed’s forecast will be more aggressive, but the fears of a hawkish revolution may be a bit overblown. Hence, investors may fill ease after the FOMC meeting – gold should catch its breath then. One thing is certain: after Wednesday, we will know more about the new Fed Chair. Gold has waited long for this moment. Stay tuned!